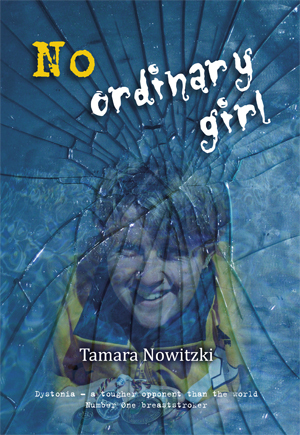 What is No Ordinary Girl about? Have you ever known something was really wrong and felt powerless to fix it? What about if the people you put your trust in are unable to explain? As a young girl I enjoyed everything: roller skating, bike riding, swimming in the surf, horse riding, climbing trees and bush walking. By the time I reached 15, I was constantly falling over. Early the following year, I was using a wheelchair, hardly able to hold my head up and was having great difficulty swallowing. All I wanted to do was to graduate from high school, go to university and compete in swimming. This is my story…. All royalties from No Ordinary Girl will be donated into the research of dystonia to work towards a cure.